Since Microsoft announced that it would part with Microsoft Edge and work on a new web browser, everyone is on the lookout for new features about it. In a previous article, we had already shared a lot of information and screenshots with you. Today, a test version is on the web and some lucky ones have been able to try it. We'll discuss with you what Edge Chromium has to offer. Several media have successfully obtained a version of Microsoft's future web browser. It should be noted, however, that this is certainly only a pre-version and that the final version may be very different from it. However, it gives a first idea of what the Redmond firm wants to offer with this new web browser. 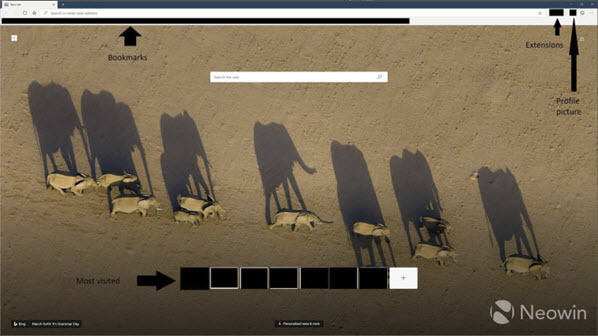 At the first launch of the new Edge, the browser offers the user to import all his data from Google Chrome (favorites, browsing history, saved passwords...) Obviously, the main page offers Bing as a search engine and profiles from Chrome seem to be integrated. There is also an extension system: the user can go to the Microsoft Store and also to the Chrome Web Store. On the hidden settings side, a dark mode is already proposed but it only darkens the menu bar. If you want to see the browser in action by yourself, we recommend that you take a look at the video provided by the Neowin site. Edge Chromium: what will the next Microsoft browser look like?